I kindly request all of you to share this link in your wall. Let us reach among many whose donation can prove a lot to the welfare of people affected by the devastating Earthquake in Nepal. Let us support the people who are in dire need of our benevolence and let us all overcome their sorrows and pain. A massive earthquake has impacted millions of Nepalese people in the capital and other remote areas of Nepal. Just in a day, close to 1500 casualties are recorded. Sadly, the number is expected to increase in a few days. The current challenge is to save as many lives as possible and provide immediate treatment and care for the prevention of communicable diseases. Immunization is widely recognized as one of the most successful and cost-effective health interventions. It prevents between 2 and 3 million deaths every year and now protects children not only against diseases for which vaccines have been available for many years, such as diphtheria, tetanus, polio and measles, but also against diseases such as pneumonia and rotavirus diarrhoea, 2 of the biggest killers of children under 5. Now adolescents and adults can be protected against life-threatening diseases such as influenza, meningitis, and cancers (cervical and liver), thanks to new and sophisticated vaccines. On World Malaria Day 2015, the World Health Organization is calling for high-level commitment to the vision of a world free of malaria. The theme, set by the Roll Back Malaria Partnership, is Invest in the future: Defeat malaria. This reflects the ambitious goals and targets set out in a draft post-2015 strategy to be presented to the World Health Assembly in May. The new strategy aims to reduce malaria cases and deaths by 90% by 2030 from current levels. Four countries have been certified free of malaria in the last decade and the post-2015 strategy sets the goal of eliminating the disease from a further 35 countries by 2030. World Malaria Day is a chance to highlight the advances that have already been made in malaria prevention and control, and to commit to continued investment and action to accelerate progress against this deadly disease. In 2015, the Institute of Tropical Medicine in Antwerp (ITM), Belgium joins forces with the National School of Public Health (ENSP), Rabat, Morocco to organize the first ITM colloquium on Maternal & Neonatal Health. The colloquium will take note of scientific progress in the domain, discuss the state of the art and share real-life experiences to improve Maternal & Neonatal Health (MNH) in low- and middle-income countries. The event will focus on three thematic areas that are of particular importance for the health of mothers and newborns in low- and middle-income countries: respectful childbirth, maternal morbidity and its consequences on newborn and women’s health, and maternal death surveillance systems. 1. Describe a time when you were faced with problems or stresses at work that tested your coping skills. What did you do? 2. Give an example of a time when you could not participate in a discussion or could not finish a task because you did not have enough information. 3. Give an example of a time when you had to be relatively quick in coming to a decision. 4. Tell me about a time when you had to use your spoken communication skills in order to get a point across that was important to you. 5. Can you tell me about a job experience in which you had to speak up and tell other people what you thought or felt? 6. Give me an example of when you felt you were able to build motivation in your co-workers or subordinates. 7. Tell me about a specific occasion when you conformed to a policy even though you did not agree with it. 8. Describe a situation in which you felt it necessary to be very attentive and vigilant to your environment. 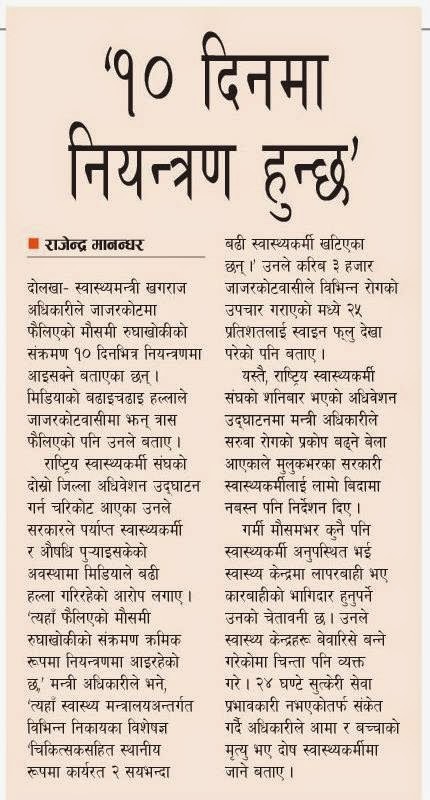 ‘Vitamin A to kids’ campaign begins Rastriya Samachar Samiti Kathmandu, April 19 The Ministry of Health and Population has started a campaign administering Vitamin A drops and deworming tablets to 3.6 million children across the country today and tomorrow. 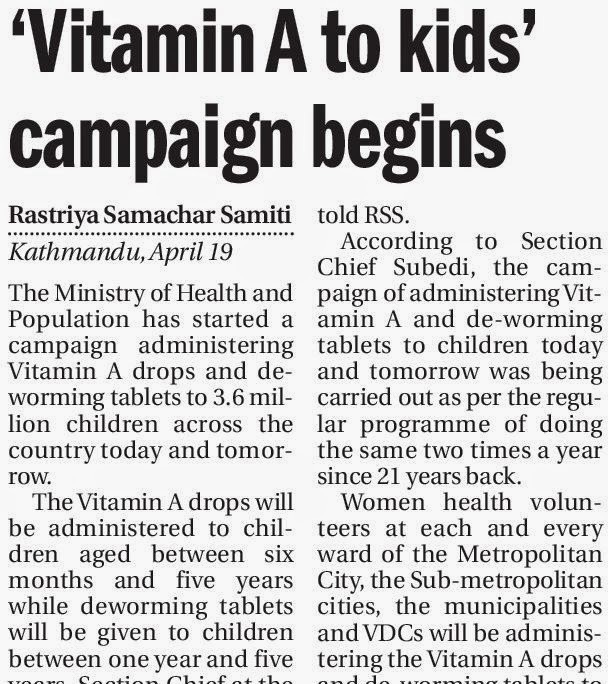 The Vitamin A drops will be administered to children aged between six months and five years while deworming tablets will be given to children between one year and five years, Section Chief at the Vitamin A Section at the Ministry, Giriraj Subedi, told RSS. 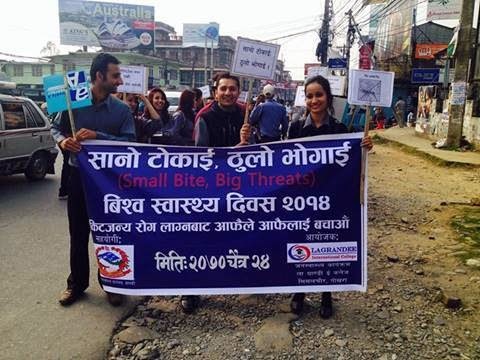 According to Section Chief Subedi, the campaign of administering Vitamin A and de-worming tablets to children today and tomorrow (April 19 and 20) was being carried out as per the regular programme of doing the same two times a year since 21 years back. Women health volunteers at each and every ward of the Metropolitan City, the Sub-metropolitan cities, the municipalities and VDCs will be administering the Vitamin A drops and de-worming tablets to children of the targeted age group. Three more die; Jajarkot flu toll 24 Himalayan News Service Jajarkot, April 18 Three more persons succumbed to flu in Jajarkot pushing the death toll to 24 since the epidemic started three weeks ago. Amrita Adhikari, just 27days old, of Pajaru VDC-5 died yesterday. Sher Bahadur Rawat, 28, of Dashera-8 and Bire Karki, 68, of Nayakwada-8 died today. 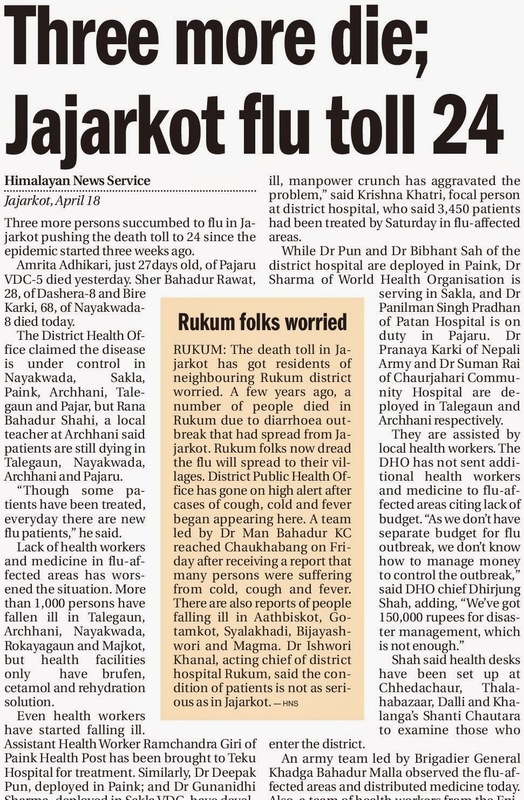 The District Health Office claimed the disease is under control in Nayakwada, Sakla, Paink, Archhani, Talegaun and Pajar, but Rana Bahadur Shahi, a local teacher at Archhani said patients are still dying in Talegaun, Nayakwada, Archhani and Pajaru. “Though some patients have been treated, everyday there are new flu patients,” he said. Lack of health workers and medicine in flu-affected areas has worsened the situation. 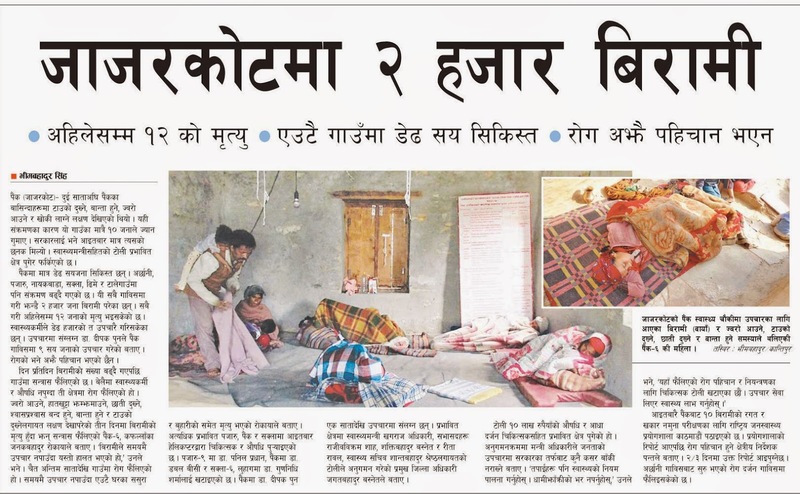 More than 1,000 persons have fallen ill in Talegaun, Archhani, Nayakwada, Rokayagaun and Majkot, but health facilities only have brufen, cetamol and rehydration solution. Applications are invited for ADB- Japan Scholarship Program available for students of Asian Development Bank’s developing member countries. The ADB-JSP enrolls about 300 students annually in participating academic institutions located in 10 countries within the region. Scholarships are available to undertake postgraduate studies in economics, management, science and technology and other development-related fields at participating academic institutions in the Asian and Pacific Region. 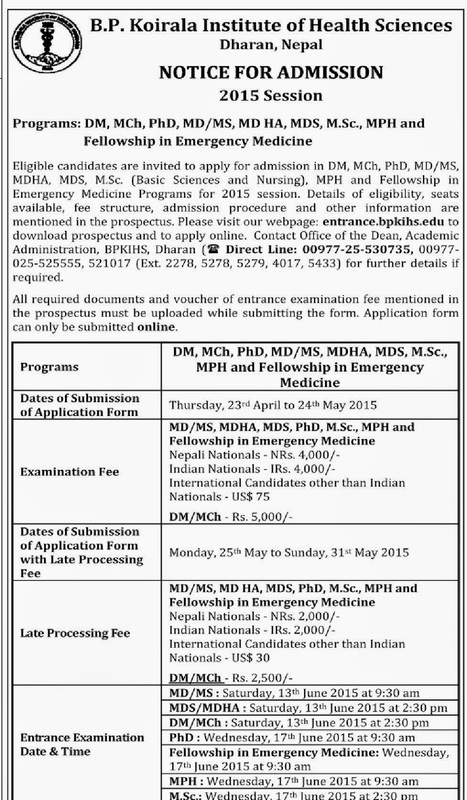 The scholarship is for one year with an extension to the second year of study. Students are expected to contribute to the economic and social development of their home countries. Mosquitoes, flies, ticks, bugs and freshwater snails can spread diseases that cause serious illness and death. Diseases are preventable Diseases such as malaria, dengue, leishmaniasis and yellow fever are preventable, yet they have the biggest impact on some of the world’s poorest people. 50% of population is at risk More than half of the world’s population is at risk of these diseases. Increased travel, trade and migration make even more people vulnerable. Protect yourself You can protect yourself and your family by taking simple measures that include sleeping under a bednet, wearing a long-sleeved shirt and trousers and using insect repellent.